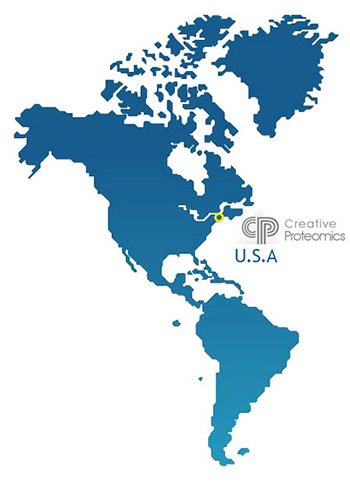 Established in 2004, Creative Proteomics has gradually developed into an integrated company that provides proteomics, metabolomics, glycomics, and bioinformatics analysis services to researchers in the pharmaceutical, biotechnology, agriculture and nutrition industries, as well as academic and government organizations. With a continuing focus on quality, we are proud of satisfying the needs of our clients both at home and abroad covering more than 50 countries and districts. Proteomics Service. Our proteome analysis platform provides protein separation, characterization, identification and quantification services, featured with high throughput and super-sensitivity. In addition, analyses of protein post-translational modifications such as phosphorylation and glycosylation are available. Metabolomics Service. We can provide a wide range of metabolomics services from discovery to targeted analysis. Our specialists are extensively experienced in handling hard-to-analyze samples including the plasma membrane, serum, cerebrospinal fluid, etc. Glycomics Services. Our glycomics expertise combined with advanced analytical techniques such as MS, LC, microarray, and NMR spectroscopy allows us to provide our biopharma customers with complete end-to-end solutions, including glycans profiling, glycosylation site analysis, glycopeptidomics, etc. Bioinformatics Services. Our team is specialized in proteomics bioinformatics, metabolomics bioinformatics, and proteins bioinformatics. By combining robust statistics and pathway analysis, we will turn data into useful, relevant and actionable information. Professional Platforms. Our platform is equipped with advanced instrumentation, including NMR, GC-MS, LC-MS, LC-MS/MS, HPLC-UV/FD, etc. Committed to Quality. Quality is our number one focus. We continuously improve the quality to offer both industry-use and research-use services to support our global clients with high-quality results and exceptional customer support. World-Class Service Capabilities. We can help with the solution to your research from the ordering to the final reporting. We want to make it easy and convenient for customers to work with us. With highly specialized technology capabilities and expertise of personnel in the field of mass spectrometry, we are well-prepared and positioned to foster collaboration in the fast-developing field of proteomics, metabolomics, glycomics, and bioinformatics.